We focus on neckties, pocket squares and handkerchief for many years. New accessories with different designs are updated constantly, which would enhance your wardrobe to high extent. Please click our brand name" ciciTree" to choose. We have quality control department to ensure every item is checked carefully before it is shipped to you. We offer no-hassle money back service, your satisfaction is guaranteed. Today ties and neckties are mostly a must at formal events or special occasions, such as daily work, business meetings, presentations, parties or weddings. It's a perfect gift which may convey your deep love to your families in Father's Day, Valentine's Day, Thanksgiving Day or Christmas Day. This twisted teardrop print is a classic design, adding color and contrast to your outfit. Various paisley patterns give you great potentiality to pull an average tailored look into the A-grade fashion. Hand-made stitching and thread are gorgeous. Good quality interlining makes our ties heavy weighted and elastic, which ensures a long time use. 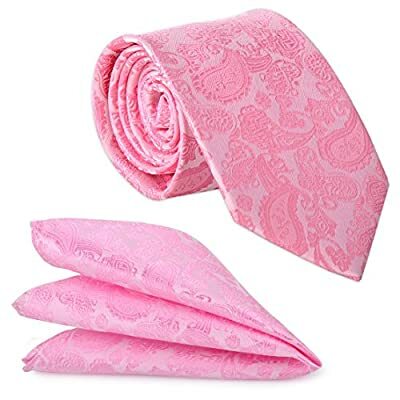 Feature with unique shape design, these silk ties are perfect in all details, they are all reflected the designer's pursuit of quality no matter fabric or type. These high quality neck ties and pocket squares are made with very high quality silk, it is soft in texture and good in feeling, can make you out of ordinary. Suitable for most occasions, no matter at wedding, party, club, church...etc. 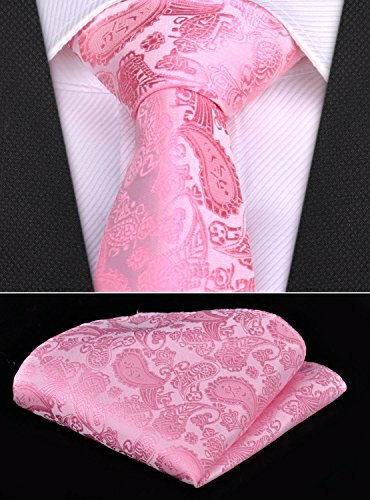 Necktie Length 59" (150CM), Width 3.35" (8.5CM) at widest. Pocket square size 25 x 25cm (approx 9.8 x 9.8 inch). Fine Textured and Exquisite Quality: Lined with good texture and perfect in all details, they are all reflected the designer's pursuit of quality no matter fabric or type. The striped tie and pocket square are always remained an essential piece of a gentleman's formal wear wardrobe. It's clean, concise and presentable. We are devoted to producing and selling various apparel accessory for many years, like pocket squares, handkerchief, neckties...etc. We provide the products with stylish design and premium quality. New accessories with different designs are updated constantly. With such stylish accessories on offer, we knew they'd enhance anyone's wardrobe to such an extent. We have quality control department to ensure every item is checked carefully before it is shipped to you. We offer no-hassle returns - your satisfaction is guaranteed. Excellent customer service is not only about meeting needs, but also consistently exceeding service expectations, that is what we believe.